It’s been four years since the still raging global economic crisis begun in 2008. Although our understanding of the crisis is getting better, we still don’t have a clear idea where the global economy is heading and what kind of growth (if any) we should be expecting in the future. According to an article published by Elsevier in early 2011, based on the Interaction Systems’ model of the global economy, global GDP is expected to almost double by the end of 2030 compared to its current level (see Fig.1). However, growth will be moderate and below the high rates of the pre-crisis period. In fact, for the remaining of the decade, from 2013 to 2020, the model estimates an average global GDP growth rate around 3.8%. For the next decade, growth is expected to decline even more to approximately 3.1% by 2030. Remember this is just a model predicting growth of the world GDP of length of time.Considering debt to GDP ratio of EU countries, budget deficit cut in the US, it is possible GDP growth can be mild. Finally a crystal ball of the economic future? 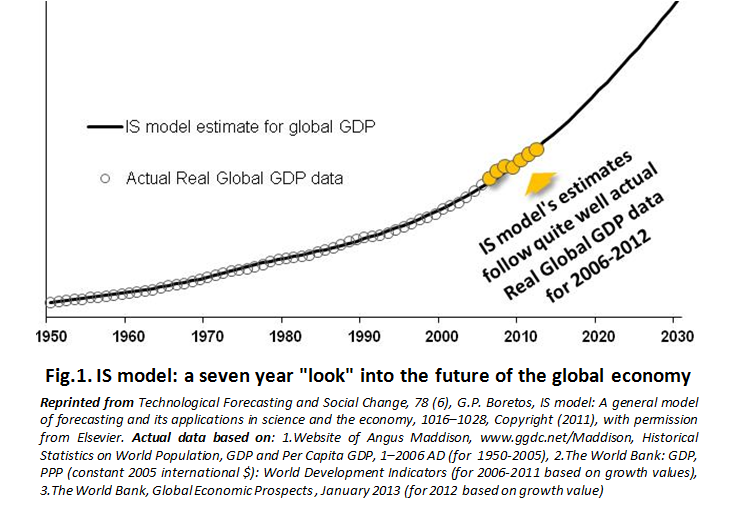 The post 2010 slope of the IS curve is very steep...what will drive the phenomenal global growth? Can this be compared with the yield curve predictions? Finally a crystal ball of the economic future? The post 2010 slope of the IS curve is very steep... what will drive the envisaged phenomenal growth? Can this be compared with yield curve predictions? If the growth rates mentioned are average annual rates, this should be clearly stated. A sentence like "For the next decade, growth is expected to decline even more to approximately 3.1% by 2030. is a masterpiece of inprecision. All figures mentioned here are year end actual or estimated values. Consequently, growth is year-on-year growth and not average annual rates. And yes, growth, according to the model is expected to fell even more to 3.1% by 2030. It's not a disaster but not a miracle growth either...And it's certainly much less that the pre-crisis growth rate levels.